There is an easy and quick way to travel from Koh Lanta to Koh Phi Phi, and there is a harder and slower way to travel from Koh Lanta to Koh Phi Phi. The easy and quick way is to travel by ferry or speedboat. Travelling direct by ferry or speedboat takes 30 minutes to 1 hour. The harder and slower route is to take a bus and car ferry to Krabi Town, and then a ferry from the nearby Klong Jilard Pier to Koh Phi Phi. Travelling via Krabi will take you a minimum of 5 hours, and probably longer if you have long waits between your arrival in Krabi and the departure of the ferry to Koh Phi Phi. Chaokoh Travel operates a passenger ferry service. Pakbara S.P.C operates 25 to 65 seat speedboats. Use the Search Box below to buy your tickets from Koh Lanta to Koh Phi Phi. Search: Enter your travel date and click to Find Tickets. Instant Ticket Confirmation: On this journey your tickets will be confirmed straight after payment. Electronic Ticket: Bring a print out of your travel voucher with you to check in at the pier. 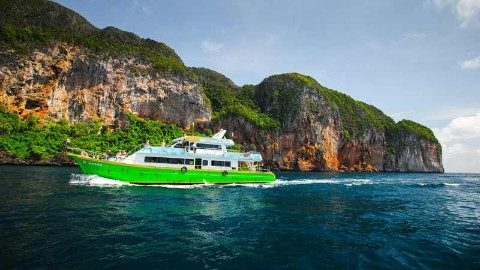 For direct travel between Koh Lanta and Koh Phi Phi you have a choice of either travelling by passenger ferry or by speedboat. Passenger ferries are the cheaper but they take longer. Chaokoh Travel operates three basic ferries with a shop, a toilet, indoor seating and travel at a cruising speed of between 13 and 15 knots. This a budget option. By contrast Pakbara S.P.C (Pakbara Speedboat Club) operates a speedboat service on the route from Koh Lanta to Koh Phi Phi. Pakbara S.P.C speedboats are a lot faster than Chaokoh Travel ferries. Pakbara S.P.C speedboats have a cruising of 25 to 30 knots effectively cutting the journey time by half compared to travelling by passenger ferry. The major downside of travelling by speedboat from Koh Lanta to Koh Phi Phi is that the seat are very close together and this makes it unsuitable for younger children whom you may have difficult keeping still for 30 minutes. The advantage of travelling by the Chaokoh passenger ferry is that you can move around more and there are both indoor and outdoor areas. Passenger ferries and speedboat services from Koh Lanta to Koh Phi Phi depart from Baan Sala Dan Pier. Both speedboat services and passenger ferries from Koh Lanta arrive in Koh Phi Phi at Ton Sai Pier.